Protests took place in five U.S. cities (Los Angeles, San Francisco, New York, Washington & Houston) and a dozen countries in Latin America, Africa, Asia, and Europe (LATIN AMERICA—Mexico, Argentina, Peru, Guatemala; AFRICA—Kenya, South Africa, Uganda, Zambia; ASIA—Cambodia, India; EUROPE—Netherlands, Ukraine). 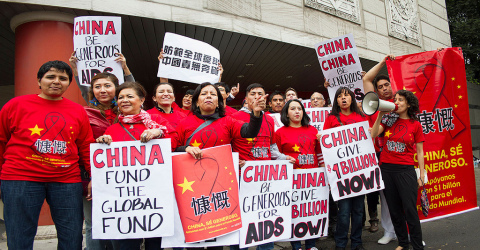 In conjunction with the worldwide protests, AHF also ran a ‘China, Be Generous-Pledge $1 Billion to the Global Fund’ advocacy ad in the print and online edition of the Wall Street Journal’s Asia edition as well as in print in Politico and on Politico.com urging increased Chinese support for the Global Fund. The ad ran Thursday, October 24th. Both the global protests and the advocacy ad placement were scheduled to highlight the issue before the next Global Fund Pledging Conference, which is set to take place December 3, 2013 in Washington, DC. MEXICO—A group of AIDS protesters demanding that China pledge $1 billion to the Global Fund protest in front of the Chinese Consulate in Mexico City on Wednesday, October 23, 2013. UNITED STATES—AHF’s James Cuccia protests in front of the Consulate of the People’s Republic of China in Los Angeles, where about 130 protesters gathered Wednesday, October 23, 2013 to demand China pledge $1 billion to the Global Fund. HONG KONG—AHF’s ‘Be Generous, China’ advocacy ad ran in the Wall Street Journal-Asia edition and in Politico (in the United States) on Thursday, October 24, 2013.